Fruit and veg never go out of fashion and whether you have a few pl ants at home or are nearly self-sufficient on an allotment, nothing beats the experience of picking and eating your own produce. There is an increasing range of varieties and exotic introductions to tempt us in the seed catalogues and garden centres but if this is your first year growing, especially on an allotment then there are some practicalities to consider before you start sowing and planting. How much space can you realistically look after? Growing annual vegetables takes a regular commitment of effort. Sowing or planting out is the easy part, crops need to be watered and weeded, thinned, pinched out or earthed up. So be brutally honest about how much time you have for GYO in addition to your ornamental garden every week. 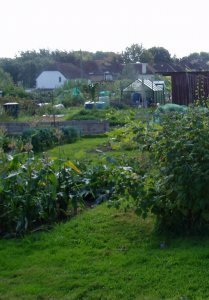 If you are taking on an allotment, it it likely that you will need to assign a couple of half-days a week to going there whereas at home you can look after a veg plot on the ‘little and often’ basis. Another time consideration is whether you have a whole allotment plot – 250 sqm, the size of a tennis court – or a half plot. Taking on a whole abandoned plot that needs to be cleared of perennial weeds is also an entirely different task from one where the previous owner has moved away leaving it beautifully tended and possibly even with some fruit bushes for you to inherit. You will want to get some benefit for your hard work in the first year so I suggest clearing and planting the plot in sections. The remainder can be strimmed while you use any spare time to clear the next strip; weed suppressant fabric excludes light and can help to reduce regrowth. Finally, grow some fast maturing summer crops in your first year and do not feel a fraud if you buy a few young plants instead of growing everything from seed. Believe me you do not need the 40 runner bean or courgette plants that you get from a packet of seeds. Grow a few each of your favourites and join the band of GYO’ers enjoying (literally) the fruits of their labours.